PALM BEACH. That sleek, black helicopter flying near Mar-a-Lago wasn't part of the Presidential fleet. But it is just as iconic. 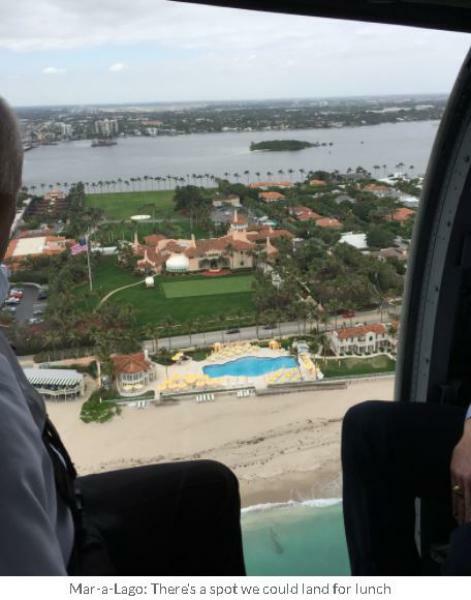 A group of us were taking a ride in a Black Hawk in conjunction with National Business Aviation Associations Regional Forum (NBAA), being held in West Palm Beach. We had just lifted off from PBI International Airport, also the world headquarters for JetLease, our host. Russ Dise, JetLease President, is selling the refitted Black Hawks in association with Arista Aviation, and prospective buyers and investors were getting and up-close and personal look at the famed military aircraft. >>>READ MORE CLICK ON BELOW LINK and CHECK OUT AMAZING VIDEO and PHOTOS TAKEN WHILE INSIDE THIS BEAST OF AN AIRCRAFT!!!! !